Will there be more podcasts? Time will tell. This is a text version of the Flash Movie promoting my book. All organisms alive today, plus the remains of all living things that have gone before, all the organic compounds, all fossils, all fossil fuels, all the biomass accumulated by this planet over billions of years, exists because information coded into DNA was accessed, read and acted upon by a cell. Before any one of those cells could grow, before any living tissue could be manufactured, before any polypeptide chains could be assembled, before anything could happen in ANY cell, DNA information had to be processed. Information processing is the very first act of Life. “So what?” says the guy in the back. Good question. What are we talking about… Information processing. The first info processor we think of is a computer. Our civilization is driven by computers processing information. What makes computers so powerful is that they represent a fundamental process. Everything we see in this physical Universe is the result of a process. So a computer can be programmed to mimic just about anything out there. A computer can do this because it processes ones and zeros, following the same basic steps as any process. It starts with input and processes that input into output. Our nervous system processes information from the environment and presents it’s output to us as consciousness. Both are information processing in action. 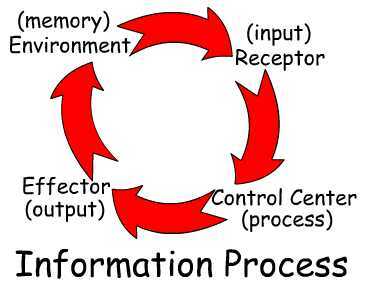 Okay, at the micro level, information processing is a pretty good model for how things work. When we take info processing to the macro level, we have billions of computers hooked together in a global network, each one cranking out billions of those process cycles every few seconds. Altogether they generate all of the content the internet is displaying right now, including this. It has taken millions of pretty smart people several decades, to figure out how to build and maintain this incredibly complex network. In the process they have discovered a set of mathematical laws that govern the growth of networks in complex systems. They have found that these laws are the same regardless of scale or implementation. That is, the rules are the same for computer networks, neural networks, cardiovascular systems, river systems, social networks, bureaucracies and just about anything that grows to move matter or information. All along Nature has been following the same fractal power laws that we have developed for the building of the internet. So, the internet represents fundamental process, and a global interconnected system of processors, that mimic Natural systems. The language of information technologies provides a common vocabulary for discussing everything from Biological Systems and Evolution to Quantum Mechanics and Consciousness. What we have here is a universal language that describes information processing and its networks in minute detail. This is the language of the 21st century, taught in schools all over the world. This is the language and model of process that we need to give us a common denominator for a unified theory of reality. Once we start to look at biological systems as being information processors first, with protein production being secondary output, a very different picture emerges of their structure and organization. Come along with me while we explore this exciting territory. Get in on the discussion right here. Comments welcome! What is consciousness? That which observes fields of information, matter and energy, and calls them reality. Need it be more complex than that? 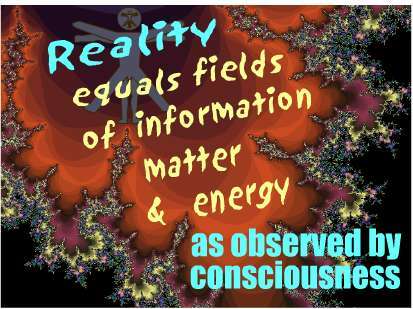 Fields of information, matter and energy comprise our environment. Our consciousness interprets the environment and acts within it. We watch. If that isn’t enough of a definition for you, there are more involved version to be found almost everywhere you look. Everyone wants to take a shot at it; we all have one. There is Consciousness Online, Center for Consciousness Studies(U of A), as well as dozens of universities, new age retreats and thousands of blogs that tag themselves as relating to the subject. The variety of descriptions reflects the difficulty of the enterprise. Every individual is describing a unique view of “reality”, that has been learned within a unique context. Every field of study has its own unique viewpoint, (piece of the elephant) that influences their observations. On top of that, each discipline develops a unique jargon to describe what they “see”. I call it the Tower of Babel approach. The more you read, the worse it gets; agreement on this subject is rare. What this discussion really needs is a common denominator. The inquiry needs to be scaled to a level of functionality, where language and terminology can be used in common. Rather than looking at consciousness from our human perspective, we need to look at how reality and consciousness relate to biological systems in general. Rather than concentrating on the complex internal details, let’s look at how the process functions at this higher level. At this level, the functionality of mobile species is simple: they move, eat, grow, expel waste and reproduce. We don’t care what goes on in their heads, just that they function within the environmental system they inhabit. However, we can note that the ability of an agent to be aware of its surroundings, is essential to three out the five functions. In its simplest form, awareness involves the processing of information. Here we can find some common ground. The studies of complex systems, quantum mechanics, cybernetics, cellular biology, single celled organisms, chaos theory, fractals, holography, bioelectrics and information technologies share some common conceptual underpinnings. They are all explorations into information processing. There are many rules and laws that are consistent across these fields of study. They share common formulae for the construction of networks, for example. The language developed by information technologies is known and understood across all languages, national and cultural boundaries. It was developed with functionality as it’s goal, and information processing and distribution it’s primary functions. 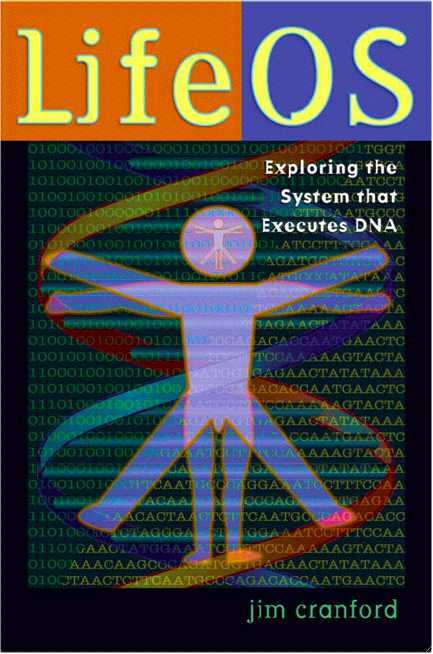 Biological systems exhibit nearly identical patterns of functionality. We find the same patterns of process in action in cells where DNA finds, copies and transfers genetic information. The universal rules and laws governing robust digital networks, outlined by Information Technologies offers the foundation for a common language to discuss consciousness, biological life and the material universe, as well. The second common denominator is that consciousness, cellular activity, quantum mechanics, atomic structure are characterized by fields. Just as our consciousness is the result of waves of firing neurons(fields), matter is the result of waves of atomic particles interacting through fields of force(energy). From plasma experiments, to growing tips of plants, to firing neurons, it is fields, processing information, that guide interactions. Consciousness is just such a field, processing input and directing actions. Looking at it in this light, all biological processes cycle through a phase of pure information, on the way to a phase of pure matter. Once it is seen as a fundamental function of biological systems, rather than an exclusive attribute of human evolution, consciousness reveals itself.